Once in a while as I am considering subjects to write about for our blog I run out of inspiration. So, this week I’ve decided to try something different and touch on a number of “odds and ends”. A mixed bag if you will of current bird issues to ornithological vocabulary. 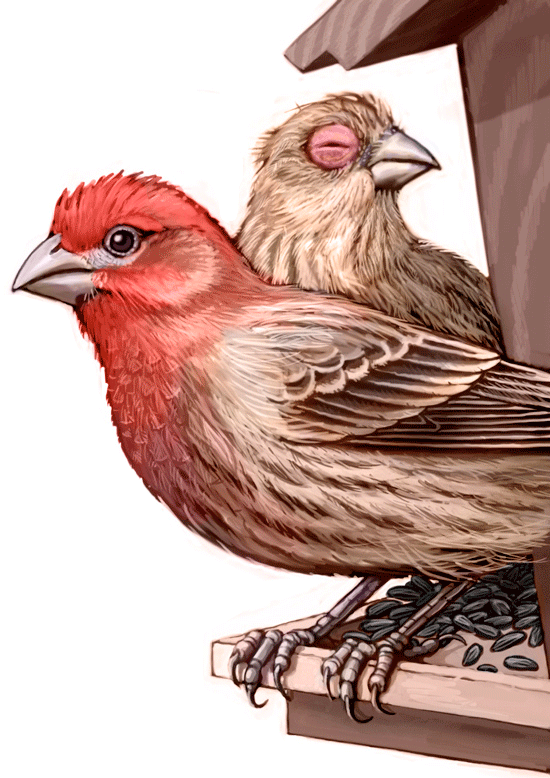 We’ve been seeing some evidence of House Finches with an eye disease known as Mycoplasmal conjunctivitis, or House Finch eye disease. And just yesterday a customer inquired about a bird that seemed sick. It did not move away as she approached, as if it was not really aware of her presence. The bird turned out to be a sick House Finch. We had one behind the store the other day that was afflicted with the disease. We hear reports and see evidence of this every year that range from sparse to wide-spread. You might observe an infected bird sitting quietly in your yard, clumsily scratching an eye against its foot or a perch. While some infected birds recover, many die from starvation, exposure, or predation. If you’re a songbird it’s impossible to survive if you can’t see. When birds are concentrated in a small area like at a birdfeeder the risk of a disease spreading within that population increases. Almost all of us have seen baby songbirds in a nest. We know they are completely dependent on the adults to keep them warm as they are featherless for the first few days and to bring them food while in the nest developing. They are completely helpless and mostly immobile. And the adults continue to feed them for weeks even after they have fledged. This is referred to as altricial. Altricial birds include herons, hawks, owls, and most songbirds. Precocial means young are capable of a high degree of independent activity immediately after hatching. Precocial young typically can move about, have their eyes open and will be covered in down at hatching. They are generally able to walk away from the nest as soon as they have dried off. They will also begin searching for their own food. Examples of precocial birds include most duck species, Wild Turkey, Quail, Killdeer and Canada geese. Have you seen them? I’ve seen several in the past few weeks. I’m referring to bald cardinals. In mid to late summer it’s not uncommon to see Northern Cardinals, and sometimes, Blue jays, completely void of head feathers. This odd appearance can sometimes be attributed to the summer molt, or more likely from feather mites. Most bald-headed-bird reports occur in summer and fall, which are typical molting times. According to the Cornell Lab of Ornithology many of these strange-looking birds may be juveniles undergoing their first pre-basic molt, which produces the first winter adult plumage. For some unknown reason, the bald birds may have dropped all of their head feathers at once. Staggered feather loss and replacement is the normal pattern. It is possible that the baldness is caused by feather mites, or lice. A mite infection is the likely explanation for the loss of head feathers only. After all, the head is the one place a bird would not be able to preen effectively to control mites. Feather mites are tiny arthropods, whose feeding destroys feather shafts. This is not a condition the affected bird will not recover from. But why does it seem to affect primarily Cardinals and Blue jays? Do other songbirds have effective methods of removing these parasites from their heads? We’re just not sure. 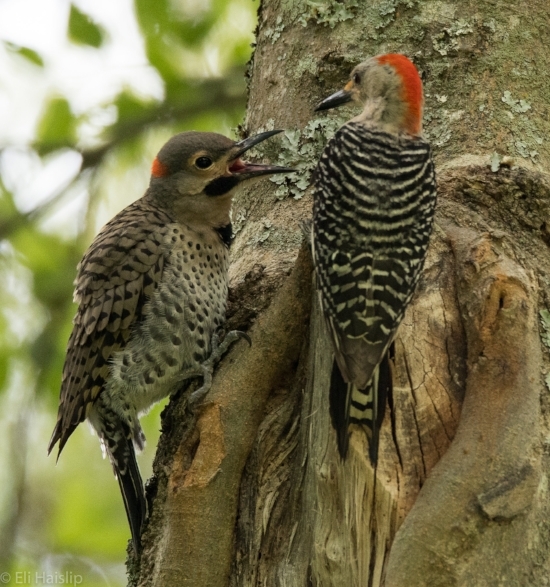 Wood Thrush Shop employee, Eli Haislip, recently photographed an adult Red-bellied woodpecker feeding a juvenile Northern Flicker. Over the course of a few days he witnessed the Flicker following the Red-bellied woodpecker and begging for food. So, is this an example of hybridization, where two different but compatible species mate, or an example of a Flicker laying an egg in the Red-bellied’s nest? I looked for information regarding hybridization among songbirds and there are examples ranging from rare to common. Some examples of common hybridization include Baltimore and Bullock’s Oriole and Indigo Bunting and Lazuli Bunting. Examples of rare hybridization include Blue jay and Stellar’s jay and Eastern Bluebird and Mountain Bluebird. This juvenile seems to possess all the field marks of a Northern Flicker and none of the Red-bellied woodpecker but we may just have to settle for uncertainty. I’ve always tried to point out to people that Eastern Bluebirds are not nearly as choosy about nest-sites as they have been portrayed. If Bluebirds really needed such specifics in the location of a nest-site they probably would have been extinct by now. And there’s nothing natural about a birdhouse but they, as well as other species, have adapted to using them because they “represent” something they would find in nature. I have seen Bluebird nests in large horizontal pipes, a hole in a basketball goal pole, and even in a stack of cement foundation blocks. But a new one was presented to me by a customer recently. A pair of Bluebirds used the abandoned nest of a Robin, Phoebe, or Barn Swallow. It was hard to see detail in the picture but the nest was built of mud and plant material on a ledge against the wall of the house under an eve. The Bluebirds raised an undetermined number of young in this nest. Everybody would like to attract Bluebirds. The fact is it is not difficult to attract Bluebirds and the single best way to do that is with a couple of nest boxes placed in good locations as we pointed out in last week’s blog. We want to help you attract Bluebirds and enjoy the entire experience from courtship to nest building, egg laying to chick development, and finally fledging. Besides the nest boxes planting native berry producing trees and shrubs, like Dogwood and Beautyberry for example, have a consistent source of water, and offering an appealing food source like live mealworms are things that will help. Eastern Bluebirds feed primarily on insects and berries’ so feeding them is different than the way we feed other birds. At The Wood Thrush Shop we have a great deal of experience feeding Bluebirds and would like to pass on our tips and tricks to help you have success and enjoy the activity as much as we do. In the spring when Bluebirds begin checking out a nest-box is the best time to begin offering the live mealworms. Why? Their need for nest boxes takes precedence during the breeding season and will bring them to your yard more predictably and reliably, and potentially for several months. Feeding them then becomes a lot easier. 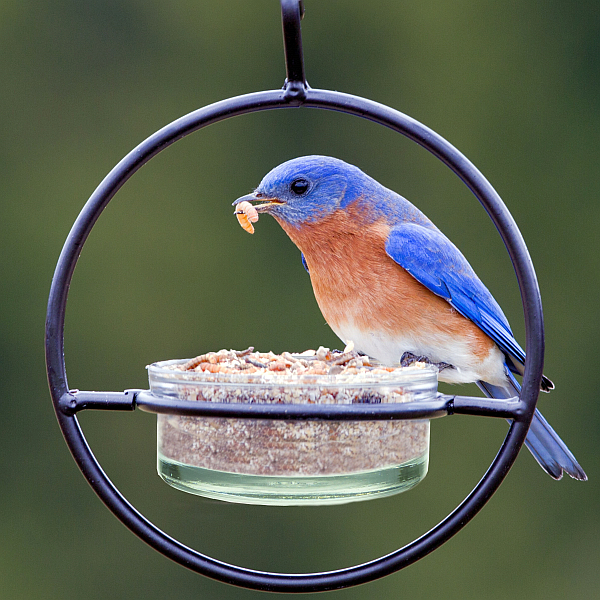 Caged type bluebird feeders help discourage larger birds from accessing mealworms. We stock lots of simple tray and dish options that work well for feeding bluebirds. These small glass dish type feeders come in a veriety of styles such as hanging, garden stake, and pole mount. After placing the worms in the feeder walk away and watch. In most cases you will have immediate success. They fly right down to the dish and gobble them up. I like to repeat this after they consume the first offering just to reinforce the process. I repeat this little scene every time the opportunity arises over the course of the next few days or weeks. Usually 4 or 5 times are enough for the Bluebirds to catch on to what you are doing. If during that first offering they fly away do not leave the mealworms there. The longer the worms are there the greater the likelihood that other birds, like Robins, Mockingbirds, or Starlings see them. If they catch on to this offering feeding the Bluebirds will then become almost impossible, not to mention possibly creating enough conflict the Bluebirds may look elsewhere to nest. Repeated successful feedings will help get you bluebirds on a "feeding schedule". When bluebirds show interest in your nesting box is the best time to offer food. So, keep the offerings minimal until the Bluebirds really catch on. Then you can increase the amounts of mealworms being offered as they raise their young. Soon they will be waiting for you, or even seeking you out in your yard as I’ve experienced in the past. Ø Offering mealworms when Bluebirds are not present is a sure way to feed a lot of other birds. Wait until you see them before offering. Ø If birds that you do not want are getting the mealworms suspend offering the mealworms for a few days or more and start over using the suggestions we’ve outlined. Ø Bluebirds may partake of other foods like dried mealworms, suet, Bluebird nuggets (a type of suet), raisins, blueberries, chopped apple and grape. Experiment and let us know your results. Ø Location is important. Don’t try to feed them near birdfeeders or a place that gets a lot of bird traffic. Feeding them close to their chosen nest box is easiest but do make sure you don’t let other birds in on the mealworms treat. Some birds may become territorial over the food source and create conflict at the Bluebird box. Ø Some people employ the method of making a sound, like whistling, while they offer the worms. Like Pavlov’s dogs, Bluebirds will key in on the sound and associate that with the treat about to be given them. I’m convinced that the Bluebirds we fed behind the store one year became familiar with the sound and sight of my truck arriving in the morning. As soon as I would get out of the truck they would be landing on nearby perches waiting for me to enter the store and bring out worms. Remember, Bluebirds will not become dependent on the mealworms but will simply take advantage while they are offered. You can suspend feeding Bluebirds any time and not worry that they will starve. Have you been listening? Birds are beginning to sing. They know spring is fast approaching. It’s apparent Eastern Bluebirds have already begun searching for potential nest-sites. Several times in the past few weeks I’ve seen two and three Bluebirds land on and look in some of the nest boxes around my yard. Their biological clocks are telling them the breeding season is almost here. Although most Bluebirds won’t begin their first nesting until early to mid-April, their search for nest sites will typically intensify in the last weeks of February and into March. Some eager Bluebirds may get on nest as early as mid-March. So, get a jump on your neighbors and offer a couple of nest boxes in good locations. If you already have nest boxes now is a good time to make sure they are cleaned out and free of old debris left over from last year’s nesting’s. Ø Bluebirds would be more sensitive to a lot of bird traffic so it’s not recommended nest boxes be placed near bird feeders. What’s a comfortable distance? It’s impossible to be exact but we would suggest 50 to 100 feet away. Ø A Bluebird box does not need to be on a pole. The advantage of a pole, however, is it allows you to position the box in the location you determine to be the best. 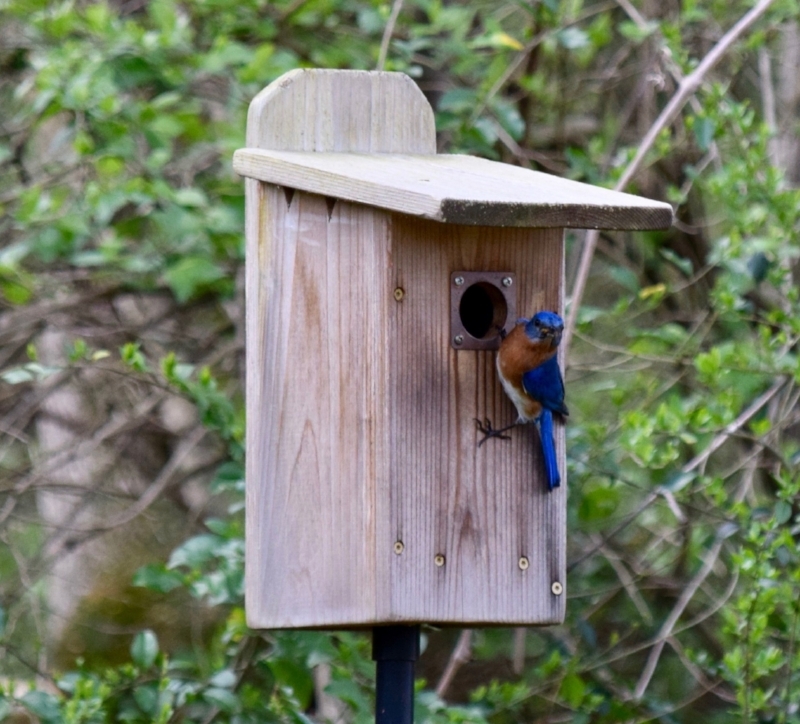 Bluebird boxes can be mounted to trees, fences, structures like garden sheds, and utility poles. A height of 4’ or 5’ is just fine. Ø How many boxes can be offered in a typical yard situation? So, there is no harm in offering lots of nest boxes (birdhouses) in your yard but do not expect them to all get used at the same time especially if they are close in proximity to one another. For instance, two nest boxes within 25 feet of one another are not likely to be occupied simultaneously. Birds are too territorial to accept this situation unless they are colony nesters like Purple Martins and Cliff Swallows. But feel free to decorate your yard with lots of birdhouses if that’s your thing. Offering multiple nest-boxes is great and it does lessen the competition for a single box, but do consider the nature of the species you are trying to attract and what kind of setting would be most appealing. And PLEASE remember to not let your desire to attract Bluebirds cause you to clean out Chickadee, Wren, and Tufted Titmouse nests. In no way does cleaning out a Chickadee nest ensure you will get Bluebirds instead. Chickadees typically nest earlier than Bluebirds and only once. Bluebirds will nest up to 3 times per season and have plenty of time. Even if you do not get Bluebirds during the first nesting there is still time for two more. Besides, if a Bluebird wanted the nest-box it would easily out-compete a Chickadee.